Wildland firefighters are hardworking, dependable, self-disciplined individuals who work under difficult and dirty conditions. They like camping, are in excellent physical condition and enjoy working closely with 19 other crewmembers. They aid in the suppression of fires in rural areas by digging fireline, fuels (brush, grass etc.) removal, and laying hoses and may provide assistance for national emergencies. Wildland firefighting can be a dangerous profession but the risks are minimized by being properly instructed on fire behavior and wearing the appropriate personal protective equipment. 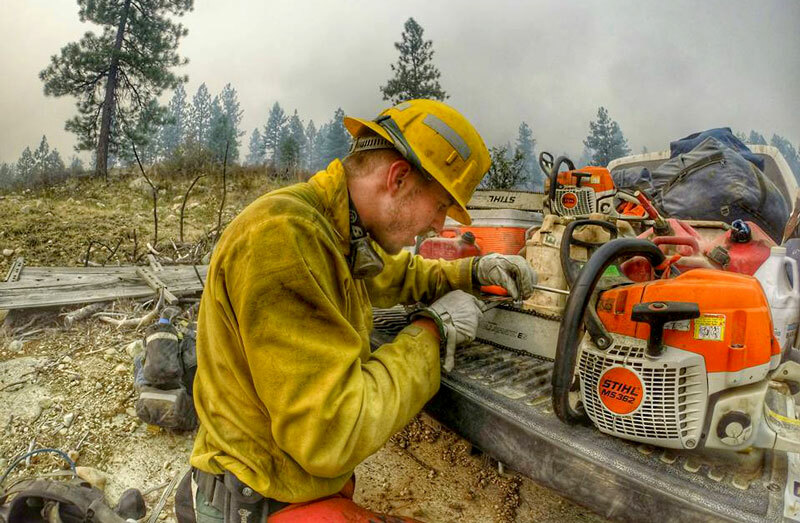 All entry-level, first-year firefighters are paired with seasoned wildland firefighters with multiple years of experience to ensure the safety of all crewmembers. What age should I be to fight fires? Is the position full-time and when does it begin? Wildland firefighter positions are seasonal, on-call positions. The duration of these positions can be unpredictable based on inconsistent factors such as weather conditions and fuels (grass, brush, etc.) moisture content. Based on the trends of past years, the wildfire season can begin as early as June and end as late as October. You must have two forms of government issued ID, one of which must have a picture. Student ID cards are not an acceptable form of government picture ID. Driver’s licenses, Social Security Cards and passports are all acceptable forms of government issued ID. The recommended personal gear for wildland firefighters will be discussed at length during training. You will need to have a good pair of fire boots (Leather work boots, lace-up, 8” high, vibrum soles, non-steel toed), a tent and a sleeping bag. The Company will provide all personal protective equipment required for the position including nomex flame resistant shirts and pants, hard hat, goggles, fire shelter, head lamp, gloves, day pack, and a duffle bag. How many hours can I expect to work while at the fire and what is the pay? Entry-level wildland firefighters can expect to work long hours, averaging 12-14 hours a day (80-100hrs/week). You may be dispatched to wildfire assignments for up to 14 days straight or more if fire conditions necessitate. How long is the training, and what does it cost? The entry-level, basic firefighting training is a weeklong course (5 days). You must attend all of the training in order to receive your red card certification. There is no fee for the training if you intend to work for the Company during the wildfire season. What is the pack test, and what if I don’t pass? The pack test, also referred to as the Work Capacity Fitness Test, is a three mile hike over level terrain carrying a 45 pound pack. This test must be completed in less than 45 minutes to ensure individuals are physically capable to perform the minimum tasks required as a wildland firefighter. If the test is not passed you may not proceed with the classroom training. The pack test can be retaken under certain circumstances. It is preferred that you live within a two hour proximity of Miller Timber Services, Inc., located in Philomath, Oregon. This is due to the urgency of fire dispatch; the Company is required by contract to dispatch a 20-person crew from its host unit in less than two hours. There are, and have been, exceptions to this which can be discussed on an individual basis with the Company. Miller Timber Services, Inc. has a national and state firefighting contract. This allows us to respond to local fires in Oregon, Washington, Idaho and as far away as Alaska. How do I get to the fire and where do I stay when I get there? Miller Timber Services, Inc. provides transportation to and from the fire location. You may be traveling by truck, van, bus, boat, plane, or even hiking into remote locations. You will be staying in a fire camp in close proximity to the fire. Are there advancement opportunities for wildland firefighters? YES! There is a complex incident command system that establishes the chain of command at every incident. This is a performance based qualifications system that measures an individual’s job performance and experience combined with formal classroom training. Miller Timber Services, Inc. offers advanced training opportunities for those individuals meeting these performance thresholds.